German stormtrooper in the First World War on the Western Front wearing the Stahlhelm. A Stahlhelm (plural Stahlhelme) is German for "steel helmet". The Imperial German Army began to replace the traditional boiled leather Pickelhaube (spiked combat helmet) with the Stahlhelm during the First World War in 1916. The term Stahlhelm refers both to a generic steel helmet, and more specifically to the distinctive (and iconic) German design. The Stahlhelm, with its distinctive "coal scuttle" shape, was instantly recognisable and became a common element of military propaganda on both sides. Its name was also used by the Stahlhelm, a paramilitary nationalist organization established at the end of 1918. At the beginning of the First World War, none of the combatants were issued with any form of protection for the head other than cloth and leather caps, designed at most to protect against saber cuts. When trench warfare began, the number of casualties on all sides suffering from severe head wounds (more often caused by shrapnel bullets or shell fragments than by gunfire) increased dramatically, since the head was typically the most exposed part of the body when in a trench. The French were the first to see a need for more protection—in late 1915 they began to issue Adrian helmets to their troops. 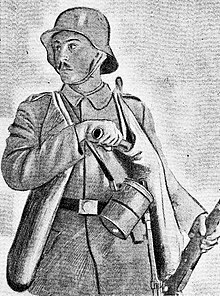 The British and Commonwealth troops followed with the Brodie helmet (a development of which was also later worn by US forces) and the Germans with the Stahlhelm. ↑ stahlhelm. Wikipedia: The free encyclopedia. Accessed 23 April, 2017.